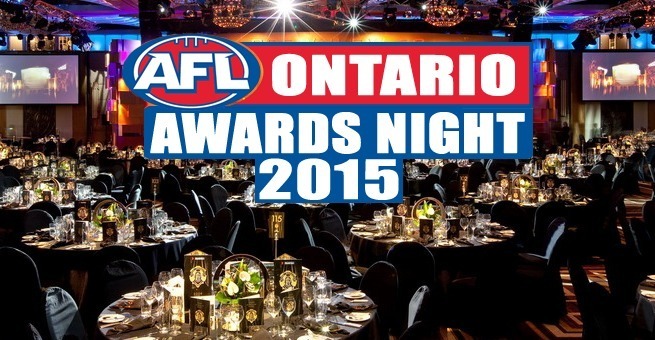 This past Saturday the AFLO held their annual Awards Night at the Strathcona Hotel in downtown Toronto. With the success enjoyed this season by both the Division 1 and Division 2 sides, it was expected that the Dingos would poll well and have a shot at several big awards. And the lads from the Red & Black did not disappoint! The dominating season from the Division 2 squad was shown in the Best & Fairest voting - the top four spots were all Dingos with longtime stalwart Mick McFarlane emerging on top. Congratulations, Mick! Top Goalkicker in Division 2 went to Paul Tinkler, the second time he has won the award. Well done! In Division 1, Wade Edwards ran away with the Top Goalkicker Award, bagging an incredible 75 for the season (a Dingos record!). Wado made a run at the Best & Fairest award as well, coming a close second. 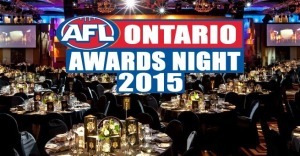 Dingos Alex Aitken and Tom Humphries also polled well in the B&F voting. Congratulations to all! The AFLO will be announcing their 2015 All Star team in a few weeks time and I'm sure we'll be seeing some Dingos names there as well.